Father Peter Farrington visited Stoke again on Monday 30th November, staying in the area until Tuesday 1st December. He wanted to be in Stoke as early as possible on Monday so that he could spend time in the new Community Hub that the Coptic Orthodox Community of St Chad is supporting. The Community Hub in Burslem, the area of Stoke where the Coptic Orthodox Community of St Chad is based, has taken over an empty shop in the main street. 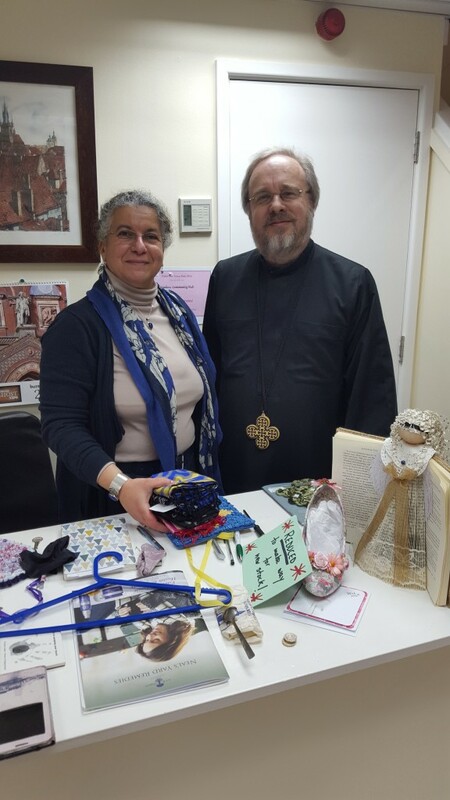 It has been organised through the commendable efforts of one of the members of the Coptic Orthodox community in Stoke, and it is a very useful means of the Coptic Orthodox Community of St Chad being part of the wider community in the area. The week before, Father Peter had been in Stoke and had blessed the Community Hub. Now he returned to spend a couple of days in the Hub, and to experience for himself its developing importance as part of the local community. It is being used as a venue for exhibiting artwork and crafts produced by local people, and for holding talks and workshops on topics of local interest. Father Peter has organised a lecture later in December by a local historian on the Origins of Christianity in Staffordshire. The Community Hub is also a place where our own Coptic Orthodox Community of St Chad can advertise itself, exhibit iconography and provide information about our Orthodox Faith. During this visit Father Peter also led a study evening at the Church of St Paul, Burslem, where the Coptic Orthodox Community of St Chad worships. Those who gathered together watched a video about the Jesus Prayer and had an interesting discussion about what they had learned. Father Peter returns to Stoke next Monday evening when he will celebrate the Liturgy of St Basil.